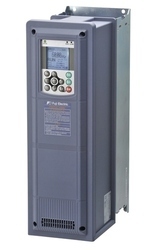 Our product range includes a wide range of ac inverter drives and inverter drives. 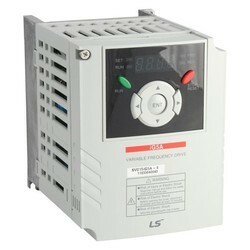 We offer the high quality of AC Inverter Drives. The FRENIC HVAC series is the dedicated inverter for HVAC that features functions and performances offer the optimal thermal environment for the people working in the building by keeping the energy consumption in various devices (compressor, condenser water pump, AHU and others) to the minimum. Fuji Electric contributes largely to global environment by realizing carbon dioxide reduction with energy saving by the inverter.Wide variation in model capacity Model can be selected from two model types. EMC filter built-in + DCR built-in type 0.75 to 90 kW (Protective structure IP21 or IP55 can be selected. EMC filter built-in type 110 to 710 kW (Protective structure IP00)Inverter capacity EMC filter DC reactor Protective structure 0.75 kW to 90 k W Built-in Built-in IP21/IP55 110 kW to 710 kW Built-in External IP00 Optimal control with energy-saving function. Functions Suitable for HVAC Us 50% of energy consumption in office buildings is related to air conditioning. Password function Stand alone The inverter can be installed independently; no control panel is required. We offer the high quality of Inverter Drives to our customers. The rated output voltage is 220V for 200V series and 440V for 400V series. When the inverter output frequency converter value is 10Hz or less, the inverter may trip early due to overload depending on the conditions such as ambient temperature. When the inverter output frequency converter value is 5Hz or less, the inverter may trip early due to overload depending on the conditions such as ambient temperature. 200V series: Make an individual order for 220 to 230V/50Hz. 400V series: The inverters with the power supply of 380 to 398V/50Hz and 380 to 430V/60Hz must be switched using a connector inside the inverter. The output of the inverter with 380V may drop depending on situations. For details, refer to Chapter 10 in the FRENIC-VG User Manual "Unit Type, Function Code Edition" 24A7--0019. Voltage unbalance [%] = (Max. voltage [V] - Min. voltage [V]) / (Three-phase average voltage [V]) × 67 Use an AC reactor if the voltage unbalance exceeds 2%. The value is calculated on assumption that the inverter is connected with a power supply capacity of 500kVA (or 10 times the inverter capacity if the inverter capacity exceeds 50kVA) and %X is 5%. The values shown apply when a DC reactor is used. If using a generator for the power source, it may burn out with high-frequency current from the inverter. The inverter may automatically reduce carrier frequency in accordance with ambient temperature or output current in order to protect itself. HD specification for heavy overload (Unit Type) | MD specification for middle overload (Unit Type) | LD specifications for light overload (Unit Type)HD specification for heavy overload (Unit Type)Three-phase 200V series Three-phase 400V series Note 1) The specification above are established when the function code F80 = 0 (HD specification) is applied. Type FRNVG1S-J: 55kW or below: provided as option, 75kW or above: provided as standard. Type FRNVG1S-E,C: All capacities are provided as option.